# 4 working mode with 5-levels brightness to match your purpose on study, work, ready or relaxing. # Built-in 5V/1A USB charging port for your digital device. # Free-angle construction to satisfy your need in differet place. # 1 hour auto-off timer. # High quality LED bulb for long work-life up to more than 10 years. Two power supply mode lamp: USB and Battery mode. 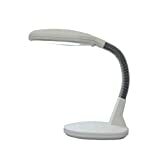 Portable foldable, eye protective reading studying working desk lamp. Energy-saving LED bulbs, high efficiency, and long life. It could be repeatedly used for more than 50000 times. 24 SMD LEDs, 2 light tube, 2 power modes for LED light, USB power cable and battery. USB power mode, one 1.2M USB power cable is include, convenient and safty. 3 AA batteries for battery power mode, the battery is arranged in the bottom of the lamp holder. When the bulbs gradually dim during usage, which means battery is at the stage of discharge. Please stop using and changing battery or use USB power mode. 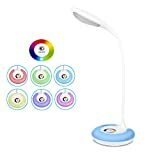 Touch Sensor Switch is applied to this study lights, and it has 3 - levels of different brightness: single touch gives lowest brightness, double touches medium and three touches the strongest. 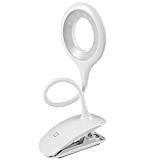 360° Rotating :Flexible Neck suitable for use in office, bedroom, school, and reading.attach to bookshelf , music stand , cabinet , headboard and other places firmly and conveniently. 3 LIGHTING MODES & 10-LEVEL BRIGHTNESS - Warm tone, cool tone and normal tone 3 lighting modes; 10-Level brightness from 10lm-800lm adjustable for your needs in different light environments. 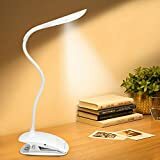 MEMORY FUNCTION - When you turn the switch off and then open it again,reading lamp can reserved the previous lighting mode and brightness settings,but if you cut off the power supply it will reset all settings. 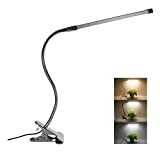 STURDY CLAMP & FLEXIBLE GOOSENECK - Fully flexible neck suitable for every place, can use in bedroom, dorm, reading, office, school; The clip on desk lamp easily bends to compact position. USB PORT DESIGN - Can be powered by USB charger, USB power bank or laptop. 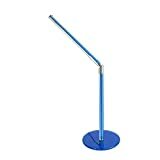 Great for Bedside, Reading, Work Tables, Mixing Tables, Computer Desks, Craft Tables and Much More.Extra Strong Clip Grips Almost Anything or Use it Free Standing. Perfect poise and balance; places light just where you need it. Creative design: Taking the moon as a creative inspiration, using the most advanced technology, and applying photos capured by NASA satellite, this moon lamp represents an authentically detailed Lunar landscape. Touch Stepless Dimming: you can adjust the brightness of the light by pressing the the button on the bottom. It has two colored lights: Warm and Cool white. Different color brings you different feelings. 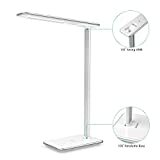 Using Time: Built-in rechargeable battery and USB charging (include cable), the working time of lamp is 4 hours to 20 hours (depends on brightness) Full charge takes about 3 hours. 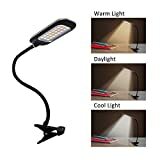 Perfect performance: The LED light source not only brings you a warm atmosphere, it doesn't hurt your eyes, and it will helps you sleep beside your bedroom. USB charging, convenient to use. Compatible with computer, laptop or other devices with USB port. 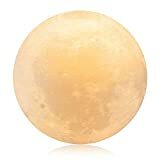 Fantastic gift: The Moon Represents My heart, it can express your love to girls boys kids, family or friends. 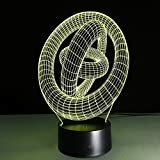 you can place it anywhere you like, which would be a perfect decorative addition to your child's bedroom night table. WIRELESS DESIGN - Rechargeable 1200mAh Li-on battery power for simple wireless operation and Light up to 2-8 hours. Includes a USB cable for quick charging and wired operation. 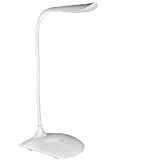 PC, power bank, smart phone charger and other USB interface can charge the lamp. 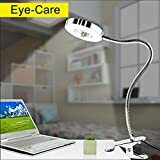 EYE-CARE: Much more soft and safety than smart book reading light with Led light source and milk Acrylic round surface, no flickering, no dizzy light, no shadow, avoiding eye fatigue..
LONG LIFESPAN: With high quality engineering aluminum, rapid heat dissipation ensures that the wick is continuously stable and efficient, much longer than the life of the plastic radiator. MULTI-FUNCTION CLIP: With the anti-skid and scratch resistant rubber mat design, allows for easy attachment anywhere. 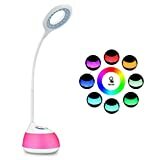 With a hanging hole, you could mount the lamp if have hooks or nails on the wall.Max clip open width:2.4"
Touch control base color and 3 brightness level:High-sensitive touch control for easy lamp brightness and color adjustment,they are independent touch switch,separately controlled,you can use it for kids,students,baby,study,reading,sleeping,bedroom,office,desktop,night light,atmosphere light ect..
[3 modes 10 Dimmable Lighting](Study, Reading, Relax) with the table lamp. 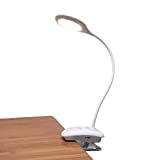 [360° Flexible Gooseneck] This reading lamp LED lamp can be adjusted within a 360 degree angle without limitation. 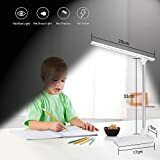 [Eye Protection]The desk lamp provides and emits even, flicker-free and non-glare light, ideal for long time of reading or writing, protects your vision and reduces the fatigue of the eyes. 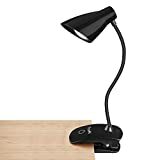 [Multi-purpose Reading Lamp] Desk lamp clamp with sturdy base and clip, so it can be used anywhere, from a study desk to a counter top. 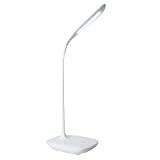 [You will get] Reading light x 1, User guide x 1, 24 month worry-free warranty and lifetime friendly customer service. 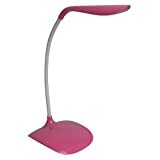 ADJUSTABLE GOOSE NECK DESIGN & STURDY BASE -- The Andrew James Adjustable Desk Lamp is 45cm in height and features an adjustable gooseneck design which lets you position the light exactly where you need it. 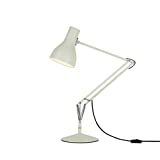 The lamp is also fitted with a solid and sturdy base for good balance. The white lamp has a neutral, professional appearance that will fit in with the majority of decors, either at home or in the office. DAYLIGHT SIMULATING BULB -- The daylight simulating bulb provides a brighter, more natural light which is kinder to your eyes in comparison to other LED or fluorescent bulbs. Using a daylight simulating bulb can benefit sufferers of Seasonal Affective Disorder (SAD) as the bulbs can help to decrease symptoms of depression and fatigue caused by a lack of exposure to daylight. HIGH FLICKER RATE & HIGHLY VERSATILE -- Daylight simulating bulbs have a high flicker rate which reduces the risk of eye strain and headaches when using the lamp for prolonged periods of time. 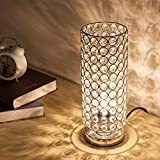 For this reason this lamp is perfect for highly visual activities such as reading, sewing, drawing and crafting , as well as, a perfect bedside table side light. SPARE BULB INCLUDED -- With an average life span of up to 8000 hours, these highly economical bulbs will last a long time. However, we have included a spare bulb with the lamp so that you have one to hand if it is ever needed. 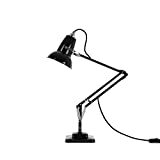 2 YEAR WARRANTY -- Shop with confidence, as the Andrew James Adjustable Gooseneck Desk Lamp is covered by a 2 year manufacturer's warranty. 3 Lighting Modes and 10 Levels Dimmable: You are able to turn on warm white for relaxing and sleeping,daylight for reading and study,cool white for working;Memory function for mode setting.You can adjust brightness from 80-800lm(10% to 100%) under every lighting mode. It will be easier to find suitable lighting for any occasions. DIY Modeling and Save Space: 180 degree beam angle is perfect with music stands, pianos, office tables, computer desks, headboards, drawing board,make up table etc.Flexible mental gooseneck (38.5cm) can be twisted in a number of shapes, and stays where you put it;With sponge inside the clamp, led clip on light opens up to 5.8cm strongly holds in place without any damage to furniture.With 1.4m long USB power cord,you don't need extension cord if there isn't an outlet nearby. Private Tooling and High-end 6063 Aluminum Materials : Beside reading lamp is well made of premium aluminum(NOT cheap plactics) to ensure better heat dessipation and it won't got hot when working, which results in longer life span for 50000 hrs. With USB power cable,you are able to connect clamp desk lamp to USB port,adaptor(5V,2A output),power bank or laptop etc.If powered with power bank, you can even take this handy clip light anywhere you go. 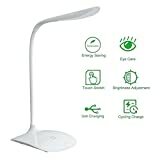 Samsung LED and Eye Protection:Clip reading light comes with Samsung LED and there is no need for bulb replacement.The head bar is covered with milky white diffuser providing even light output without dazzling, flicker,glare.It won't make eyes fatigued if staying in the light for a long time,ideal LED clamp desk light for student,college. 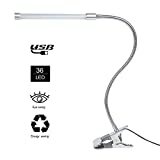 Safe and Eco-friendly:Clip on desk lamp is No lead or mercury, No UV or IR Radiation,using V0 rating fireproof wire,which never spontaneous combust in fire. As an LED it consumes 75% less power than traditional incandescent lights, which means smaller electricity bill and carbon footprint. 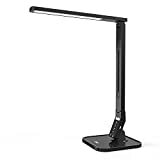 LED desk lamp does it with easy-to-use touch control, third gear light intensity, humanized design , make your eyes in a comfortable environment.The light looks like Natural light! 3 level dimmable touch control (reading, relax, sleep), 14LEDs,the brightness level is up to 210 lux which tested to a distance of 30cm. with output lower than 1.5W. Energy saving LED light source no radiation no flicker,eye partner,Lamp can be adjusted 360 degrees, user-friendly design,Low consumption and long lifespan, the battery can be cycle charged,no "old bulbs" anymore, saving time and money. Perfect Bedside Lamp. 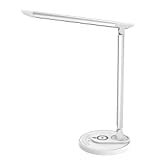 TROND Halo 2W features a round lamp head, 45cm-long aluminum gooseneck, and low-profile mounting bracket, which enables it to be mounted to the back of your nightstand, or the headboard of your bed. It helps to keep your countertops clear of clutter and creates a minimalist lifestyle. Dedicated Lighting Area. TROND Halo 2W emits directional light towards the specific area without disrupting the surrounding area. This way, the light won't spread out and you can enjoy reading without worrying about the light bothering someone next to you. Latest surface lighting source and innovative light guide panel help to create a flicker-free, anti-glare light without ghosting. Enjoy some quality reading time every night before sleeping! 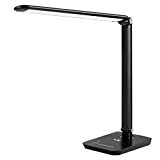 Universal USB-Powered LED Lamp. 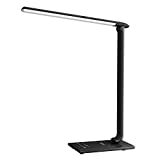 Unlike other LED desk lamps from TROND, TROND Halo 2W doesn't come with an external power adapter. 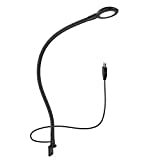 Instead, it has the integrated 5ft-long USB cable with the Type A connector, and can be powered by any 5V USB devices, such as your USB charger or power banks. You may consider ordering TROND G2U, G5 or Prime series power strips with USB to charge TROND Halo 2W. 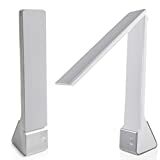 What You Get: TROND Halo 2W LED Desk Lamp, 5ft Integrated 5V USB Cable, 3 screws, Welcome Guide, 18-MONTH TROND warranty & 30-DAY money back guarantee. 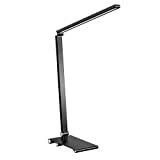 MULTI PURPOSE READING LIGHT: it can stand on desk with its own anti-skid base or can be clipped almost anywhere, such as bedframe,table, etc. 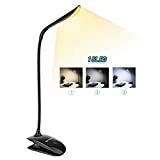 3 LEVELS BRIGHTNESS BOOK LIGHT:3 levels for you to choose, Low bright is ideal as your bedside lamp while High brightness is suitable for reading and studying. 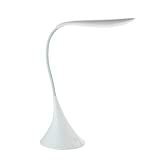 360°ADJUSTABLE LAMP ARM: Seamlessly bend the lamp arm to always get the best illumination angle. USB RECARGEABLE CLIP LAMP: Built in 1200mAh rechargeable Battery with USB interface design, can be powered by USB port, phone adapter, etc. 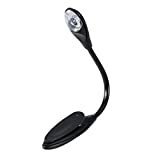 EYE PROTECTION: The book light provide soft Eye-Care Lightning Source, flicker-free, anti-glare light without ghosting to relieve eye fatigue.